Hamilton’s Ari Afsar spoke from Chicago about the new Broadway show Dear Evan Hansen and its message towards teenagers but her words reflected the general atmosphere at BroadwayCon 2017. Held last weekend (Jan 27-29) at the Javits Center in New York City, the second annual BroadwayCon was filled with inclusiveness and empowering messages. During the “Hamilton: The Next Administration” panel alone, there were numerous references to the Women’s March and President Trump—plus comparisons between the newly appointed leader of the United States to King George III—as the castmembers tried to make sense of how art could imitate reality and vice versa. 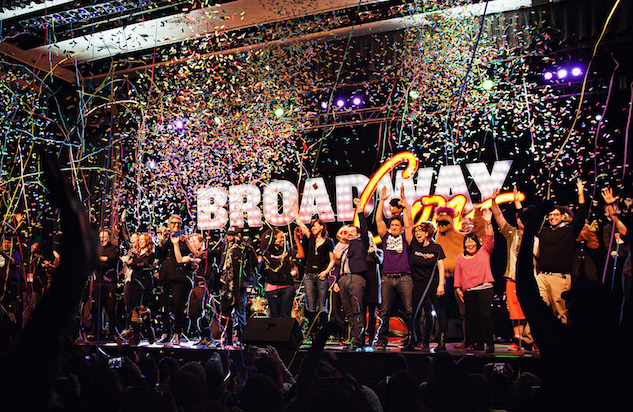 In its second year, BroadwayCon was more inclusive of the entire artform that is Broadway, and was better attended than the inaugural 2016 event, which coincided with the blizzard that blanketed New York City and surrounding areas the same weekend. And a part of it they were. Broadway staples came out in droves—Anelli referenced a moment earlier in the weekend when Chita Rivera jumped on stage during Joel Grey’s panel and hugged him—and the marketplace was brimming with vendors, ranging from small jewelry stores and Broadway-oriented fundraisers to major brands like Playbill and Stubhub. And much of it was interactive; fans were able to participate in autograph and photo sessions with numerous stars throughout the weekend, and there were a lot of general different activities held at BroadwayCon, including a slumber party and star search. The highlight of the third day, and perhaps BroadwayCon overall, was the First Look event. Upcoming shows including Charlie and the Chocolate Factory, Amélie, Bandstand, Come From Away, Hello Again (an upcoming film based on a musical rather than a new show to Broadway), Indecent, Miss Saigon, Significant Other, Sunday in the Park with George, The Play That Goes Wrong and Anastasia all were unveiled for the theatre-loving audience as directors, playwrights and performers took the stage. And, in Broadway and BroadwayCon fashion, many of the speakers took it upon themselves to address how their art relates to the current state of U.S. politics. Broadway, a safe space for art and artists to thrive, was embodied by the weekend, but no more so than by Anelli’s finale speech during the closing ceremony where she implored people to remember the welcoming environment of BroadwayCon whenever facing hardships and intolerance. “Joy can be resistance, art can be power,” she said amidst tears, as thespians and theatergoers alike sung BroadwayCon 2017 to its close.